I love the Montreal Canadiens. The worship of La Sainte-Flanelle and Les Glorieux are literally a part of my DNA. My father proposed to my mother shortly after the Canadiens won the Stanley Cup in 1973. When the Stanley Cup was awarded to the Habs on May 21, 1979, I was celebrating in utero. So I was devastated when my hero Patrick Roy and his team were bested in six games by the Calgary Flames in the 1989 Stanley Cup finals. I was convinced that Roy and the Canadiens were unbeatable that year. Number 33 was, to my 10 year old brain, the greatest goalie in the history of hockey. We* had guys who could score in players such as Mats Naslund, Bobby Smith and Stéphane Richer. We had guys with skill and guts, like Shayne Corson and Guy Carbonneau. We had players who could get under the opposing team's skin, guys like Chris Chelios and Claude Lemieux. But the Flames proved too strong. 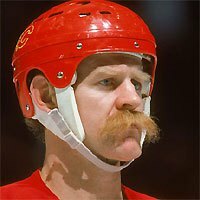 Perhaps it was the grit and gumption of Dougie Gilmour, or the power of Al MacInnis' slapshot or maybe, just maybe Lanny McDonald's moustache emitted too much power for the Habs to even have stood a chance. Just don't tell me Mike Vernon outplayed Patrick Roy (even though he probably did). To be fair, the Flames finished first overall that year, with 117 points to the Canadiens' 115. Were the Habs less than the sum of their parts, or were the Flames more than the sum of theirs? I don't know, I was 10 years old. 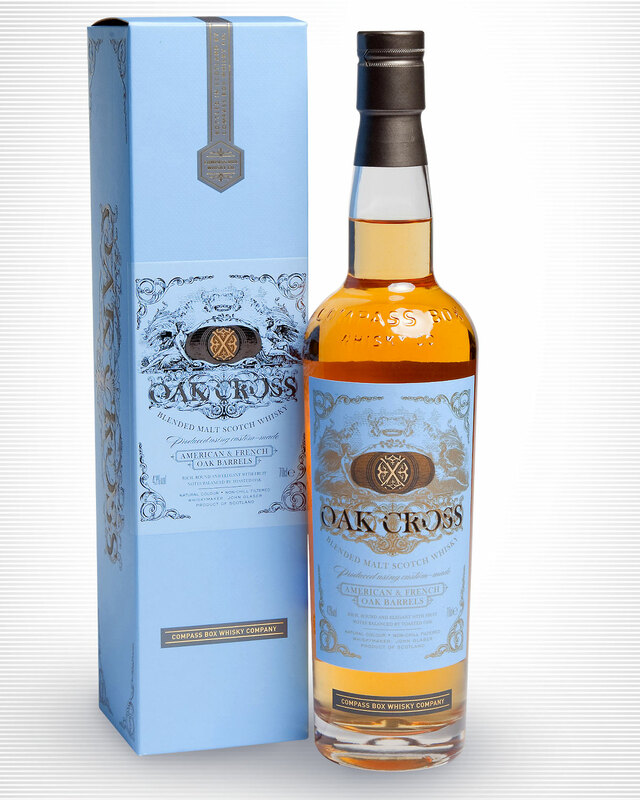 But it makes for a great segue into my review of Compass Box's Oak Cross, a blended malt whisky. What's a Blended Malt? What's a Compass Box? For those who don't remember or who are new to Scotch whisky, a Blended Malt, which used to be called "Vatted Malt", is a blend of malt whiskies (i.e. whisky made entirely from malted barley) from different distilleries. There is no grain whisky (i.e. whisky made from wheat, corn or rye) in a blended malt whisky. Compass Box, the brainchild of former Johnnie Walker marketing director John Glaser, makes blended scotch whisky (contains grain whisky) and blended malt scotch whisky (does not contain grain whisky). One is not better than the other; they are simply different. And Compass Box doesn't really distill whisky, as it were, but they are Whiskymakers. How does that work? Glad you asked. A Whiskymaker is someone who feels a need and an obligation to make things better - to ask questions, to challenge, to experiment. When it comes to whisky and its enjoyment, we keep our minds open to new possibilities - new production processes, new combinations of flavours, new ways of sharing and enjoying great whisky. As Whiskymakers, we work with a range of partners to explore the interaction between maturing Scotch whisky and oak over the course of time. From sourcing the best cooperage oak in the world from the Vosges forest of France and the woods of Missouri, to individually sampling almost every cask we use in each of our blends, we are fanatical about quality and believe that every stage of the process has the potential to add to the finished blend. Put plainly, Compass Box buys casks of whisky from other distilleries, blends them in precise ratios, ages them further in different casks (different cask sizes, char levels, different wood types etc.) 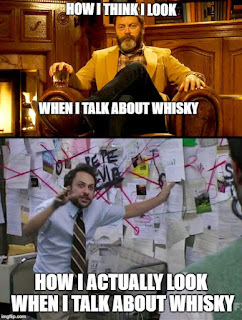 and blends them again to create a unique flavour profile.They never use E150A (caramel colouring) and they never chill-filter their whiskies. They also provide an infographic (link here) so you know almost everything about what's in your bottle. They don't disclose the age of the various components because the Scotch Whisky Regulations only permit the disclosure of the youngest component whisky. Allegedly. It's kind of complicated. Compass Box isn't perfect, but you'd be hard-pressed to find a company that discloses more information to their consumers (Bruichladdich might be neck and neck with CB). So you can probably guess why Compass Box has been called "blended whisky for true whisky geeks". So what's in Oak Cross? According to the previously linked fact sheet, its volume is malt whisky from Clynelish (60% of total volume), malt whisky from Dailuaine (20% of total volume) and malt whisky from Teaninich (20% of total volume). How does it taste? Finish: Oak tannins, waxy - almost like melted candle, but in a pleasant way, a hint of ginger, cayenne Pepper. Oak Cross is pleasant when chilled. It doesn't feel weak or thin. Good job, Mr. Glaser. John Glaser, the man behind Compass Box, has been called many things; a New World visionary intent on shaking up the Old World status quo, a blustering, self-serving opportunist, and a clever marketing guru among other things. No matter your perspective on the founder of this company, Compass Box has produced some incredibly interesting whiskies. They've managed to get people talking about openness, transparency and honesty in a business that thrives on mystique. I contacted Compass Box for more information on my bottle of whisky, and they answered all my questions. I won't re-post their answers here, per their request, but they were more open and accomodating than any other whisky company. They also answered my questions in less than 24 hours. I'm very impressed with this company. Oak Cross Blended Malt is good, but like the 1989 Montreal Canadiens, it isn't championship level. Would I buy this again? Absolutely. The price is very reasonable and the whisky is pleasant, refreshing and original if somewhat one-dimensional. It's mostly vanilla and oak spices, albeit pleasant ones. Your mileage may vary. I've had people tell me there was a note reminiscent of "baby throw-up" in here. I didn't taste that at all, but you may want to try before you buy.